On Page SEO:refers to the structural On Site changes applied to a website to make it search engine compatible. The process starts with a detailed On Page SEO Analysis to identify potential areas of improvement. Once finalized the factors are then improved to enhance website’s search engine friendliness. White Hat On Page SEO: is the process of applying SEO techniques as per the search engine guidelines provided for a website. Various Search Engines term their own best practices which they expect every webmaster to ethically follow. Websites in compliance to these guidelines i.e. using white hat SEO practices tend to rank better for target keywords. 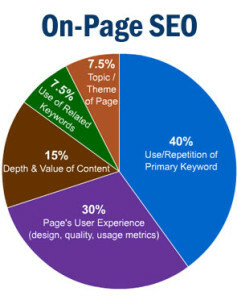 Title & Meta Tags: are considered as one of the most important aspect of On Page SEO. These small snippets of descriptive text completely explain a page and most importantly represent a website in search results. Content Optimization: Content Is The King! Relevant, Informative & Interesting Content is what users visit a website for and that’s exactly what Search Engines want to deliver in search results. One of the most important factors affecting search engine rankings. We perform content quantity, duplicacy keyword density and relevance check to ensure the page content is effective enough for users as well as search engines. Heading Tags: classify and bifurcate the page content into main, sub and sub-sub headings as per importance. Heading Tags from H1 to H6 structure the page content on the basis of importance. Page Speed: is the time taken by a web page to load. Various factors like page code, css, scripts, images and other resources used in a page contribute to the page load time. Faster loading pages are preferred by search engines from user friendliness prospective. Image/Video/Document Optimization: These website assets need to be embedded with references to exactly define these scope and relevance in accordance to the website. Link Optimization: is the process of optimizing the linking structure for better usability. Sitemaps (XML & Html): is a collection of all the website pages. Sitemaps helps users in traversing to the right pages in a website and search engine spiders to index all important pages. Robots.txt: is a file containing instructions for crawlers guiding them on what to crawl and what not to in a website. Social (Open Graph) Tags (): allow you to control what content is displayed when a page is shared on social platforms. W3C Compliance: signifies clean code in compliance with all coding best practices. Analytics and Webmaster Tracking: helps in keeping track of the website traffic as well as health check. Keyword Rankings: should be tracked on atleast monthly basis to evaluate the improvement and strategize accordingly. Broken Links: if present can hamper user experience and hence search engine reputation. They need to be identified and removed from all pages.